Custom online ticket templates maintain your exact branding and patrons won’t know that they have left your site to purchase their tickets. Receive full information from all online ticket buyers: name, address, phone and email address. Create and track unlimited number of "House Accounts" - simplify the process of offering special rates for groups - especially student and business groups. 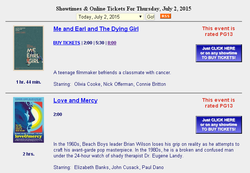 Limit sales to a total number of tickets sold, sales date range, screening date range, etc. Can also be located at a remote location - imagine having a way to sell tickets from a central arts association, college student center, shopping mall, another friendly local business nearby, etc. Fully-brandable incorporating your logo and color scheme, etc. Imagine having your own iPhone and Android app that your customers can download from the App Store under your cinema’s name – and for not a lot of money! Concessions Info can handle all of your POS needs. Quickly sell tickets and anything and everything: food, snacks, candy, soft drinks, mixed drinks, beer, wine, memberships, branded merchandise, books, clothing, gift cards, take donations and more. Delight your patrons with our fast processing and dramatically shorten your ticketing and concession lines. You’ll be amazed how much more income you’ll be able to bring in with Concessions Info. Can handle your unique member discount policies including tracking of free or discounted drinks, tickets and/or popcorn. Can quickly scan member and house account bar code IDs to immediately look up patron records - or - patron records can be looked up by name or phone number. Our unique anonymous sales matching feature can convert anonymous quick sales into identifiable known ticket sales. Offer any kind of Membership – individual, dual, family, corporate/business, Gold vs. Silver, lifetime, etc. Easily target members for renewal letters and/or e-mails and generate custom letters and mailing labels or envelopes directly from our system. Can be set up to handle your unique member discount policies including tracking of free or discounted drinks, tickets and/or popcorn. The most comprehensive fundraising capabilities of any ticketing system on the market. Take donations at the POS or after each online ticket sale or online via your own custom online giving page. Online donations download automatically and are matched to existing donor data avoiding the creation of duplicate records - with full support for automated recurring giving. Quickly see your patrons giving histories and total involvement – and easily view giving and ticket sales across all family members. Integrated Wealth Prospecting via our partnership with both Donorsearch and the Wealth Engine. We will convert all of your patron and donor data with full giving and membership histories from any system – including Raiser’s Edge, Gift Works, Donor Perfect, etc. Sell tickets directly from your own website. Send targeted blast emails through our interface with either Send Grid and/or continue using your account with Constant Contact, Mail Chimp or Vertical Response. Our built-in e-mail connectivity tools allow you to send your targeted lists directly from our CRM to these leading e-mail providers. Customizable, standalone "Mailing List Sign Up Form" option allows interested patrons to sign up for your mailing list directly from your website into our CRM database without creating any duplicate records. Our solution allows you to sell your own brandable gift cards in ANY dollar amounts. Sell them quickly from our POS or through your website. Redeem them online (coming soon!) or in person. Our gift cards act like a credit card and can be swiped at the POS. Quick Gift Card balance look up at the POS. Through our partner ship with Webaissance, we are able to offer our customers brand new websites with modern designs which are easy to edit and are fully integrated with our ticketing engine to minimize the tedious tasks of keeping your website content and movie schedules current. Not only will you have an exciting new web presence with update branding but you'll save hours of time each week over your current methods. We partner with Diamond Payment Systems whose universal credit card gateway will allow us to use your existing credit card merchant processor – or we can connect you with another partner, ProcessPoint, who can help you find a very low-cost, non-profit friendly, credit card charging solution.